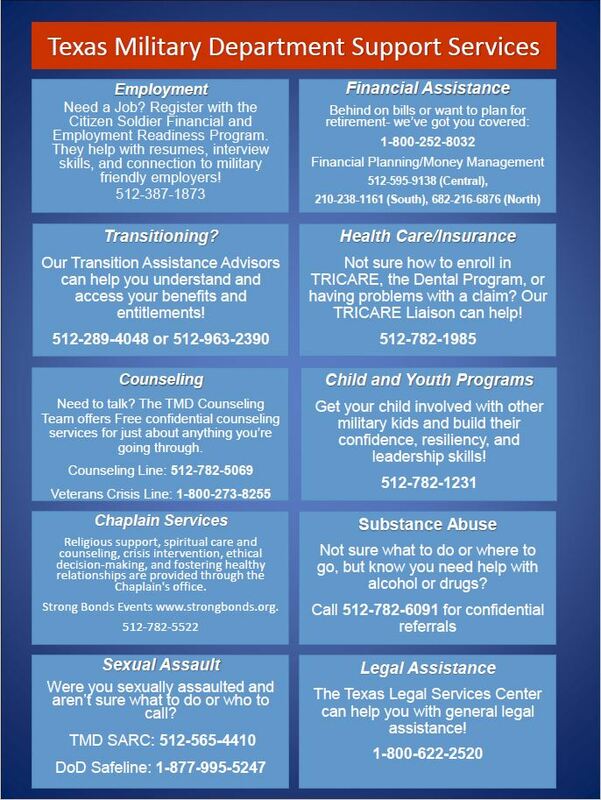 Texas Military Department Family Support Services Branch is the umbrella organization for programs that provide a continuum of care and support services to Service Members and Families during deployment and sustainment operations. Despite the fact that our Soldiers, Airmen, State Guardsmen, equipment and training are fully prepared to accomplish all State and Federal mission requirements, it is critical that their families likewise be properly prepared and resourced to function during the spouse's absence, whether that may be responding to a natural disaster in Texas or fighting in Overseas Contingency Operations. It is the intent of Family Support Services to prepare and empower TMD Service Members and Families to be resilient as future mission requirements will necessitate. Through the various program within Family Support Services and Community Partnerships, we are prepared to execute Resilience, Prevention, Family Readiness, and Reintegration activities to enhance the capabilities and resilience of our TMD Service Members and Families.